Overweight and with a past of alcohol and substance abuse, Rich Roll turned his life around at 40. Although the image of veganism is slowly changing, when people think of the word 'vegan', many still associate the lifestyle with: extreme, unhealthy, unnatural or even weak. Vegan ultra-athlete, Rich Roll shatters those impressions. The 51-year-old is supremely fit, a best-selling author and an example that it's not too late to seek change in your life. After a decade of alcohol and substance abuse, and then another decade of working himself into the ground as a lawyer, at 40-years-old, Roll was overweight and facing a life crisis. "I was somebody who grew up with a lot of promise in my life. When I graduated high school I had fantastic grades and I was a really great swimmer," Roll told The Huffington Post Australia. "I ended up going to Stanford, an amazing academic institution with an amazing swimming program. When I arrived there I proceeded to give away a lot of these opportunities because I became more interested in drugs and alcohol than I did in anything aspirational." Roll was able to graduate from college, but he found himself "on this train that was pulling out of the station towards becoming an alcoholic". I was having vodka tonics in the shower, sneaking drinks throughout the day, just living like a life-long 65-year-old alcoholic. "Throughout my 20s I partied and didn't get life too seriously, and it worked until it stopped working," Roll said. "I started having a lot of chaotic experiences and the quality of my life devolved to the point where, at the end, I was a round-the-clock drinker. I was having vodka tonics in the shower, sneaking drinks throughout the day, just living like a life-long 65-year-old alcoholic. "I alienated myself from friends and family, I was basically teetering on homelessness and I was on the verge of losing my job as a lawyer." Roll had to go to rehab where he was for 100 days. At 31 years of age, Roll got sober. "That was the period which really gave me a completely new toolbox for how to live my life," Roll told HuffPost Australia. "I then spent my 30s trying to repair all the damage I had created as a result of all my drinking and using, and so I thrust all of my substance and alcoholic tendencies into work, a unhealthy lifestyle and dietary choices. "Basically, I was on the track to achieving the American dream, I was going to do what I wanted, I was working 80 hours a week in a law firm, but just eating fast food, not exercising and not taking care of myself whatsoever." And then came the tipping point. It was my second rock bottom. My first was when I knew I was an alcoholic and decided to go to rehab, and the second one was when I realised, 'I have to change how I am living. This is not working anymore. I'm going to die if I keep treating myself this way'. "By the time I was 39, I had achieved all of these goals that I had set for myself. I had become successful, a responsible member of society, I had met my wife, we were starting a family, I had a nice sports car in the driveway -- I had a lot of good things in my life," Roll said. "But by the time I was 39 I was 50 pounds (22kg) overweight and having an existential crisis about what I was doing with myself. I was so intent on proving to myself and the world that I could fix this problem, but I never stopped to think, 'Is this really how I want to live? What is it that I want?'" "One night, shortly before I turned 40, I became out of breath from a simple flight of stairs when I was going to bed. I had to pause, I was winded, there was tightening in my chest, sweat on my brow. I feared I was on the precipice of having a heart attack. "Heart disease runs in my family. It's a terrifying ailment. "That was when I knew. It was my second rock bottom. That thrust me into this new phase of trying to find a way to eat and live that would be alignment with my higher self and my healthiest self." After trying a range of diets over the course of the next year, Roll finally came across a wholefood vegan diet. About 10 to 14 days into eating a completely wholefood plant-based diet, I realised how different it was to everything else I tried. I wanted to feel this way all the time. 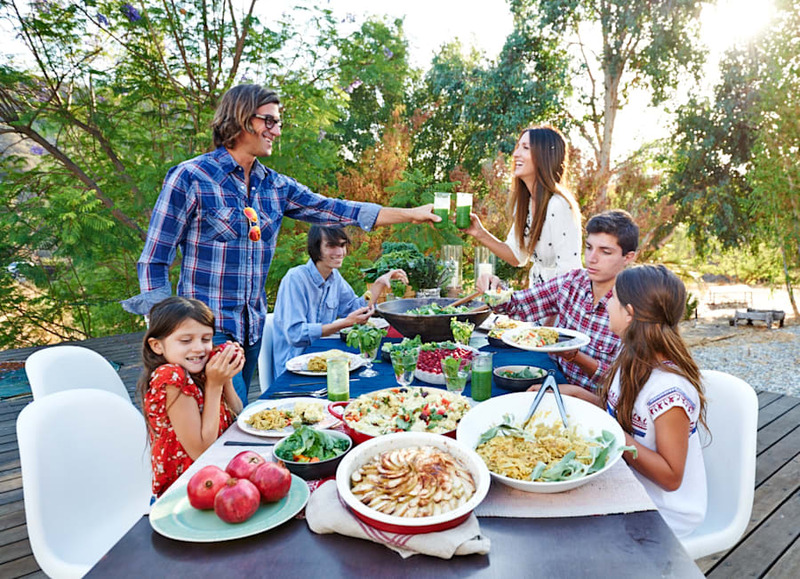 Rich Roll with his wife, Julie Piatt, and four children. "It changed everything. I had so much energy all of a sudden. I actually wanted to take care of myself. I wanted to exercise," Roll explained. "About 10 to 14 days into eating a completely wholefood plant-based diet, I realised how different it was to everything else I tried. It revitalised me like no other way of eating. I wanted to feel this way all the time." It was then that Roll became more educated about the benefits of a wholefood plant-based diet. He enlisted the help of an old swimming friend, who acted as a mentor to help make the transition so that he could do so responsibly and intelligently with the right tools. As Roll became fitter, stronger and lost 22kg, becoming an ultra-athlete was almost a natural progression. "I wasn't intent on becoming a competitive athlete in my 40s, but with every consecutive week that went by, I was getting fitter and stronger, and I became amazed at the resilience of the human body," Roll said. "That got me interested in testing the outer limits of my own potential and, ultimately, that's what attracted me to the world of ultra endurance and the races I compete in." Roll began to train for the Ultraman race, a three-day invite-only double Ironman distance triathlon which circumnavigates the Big Island of Hawaii. In 2008, with only six months of training, Rich achieved the second fastest swim time and finished 11th overall in the event. "I've raced in the Ultraman a couple of times. In 2009, I had a 10-minute lead on the first day and suffered a terrible bike accident on the second day that took me out of contention and had me benched for an hour. Ultimately I did finish the race and came sixth place overall. I haven't won that race but it was my best performance." Fast-forward to now. Roll is now 51, still a vegan and ultra endurance athlete, and a best-selling author. "I've been doing it for 10 years now and I don't know if there's anything in my life that's the same, except that I'm married to the same woman," Roll said. "I don't practise law anymore. My life is about health and wellness and all these things I would never have imagined. "There's nothing that's not improved or impacted positively and significantly by living this life. My plant-based diet is what propelled me, what made me capable of doing what I did. "My plant-based diet is not a hindrance, it's a secret weapon." If you're wondering, at a training point of view, how a wholefood vegan diet is beneficial to an athlete, it's all about reducing inflammation. 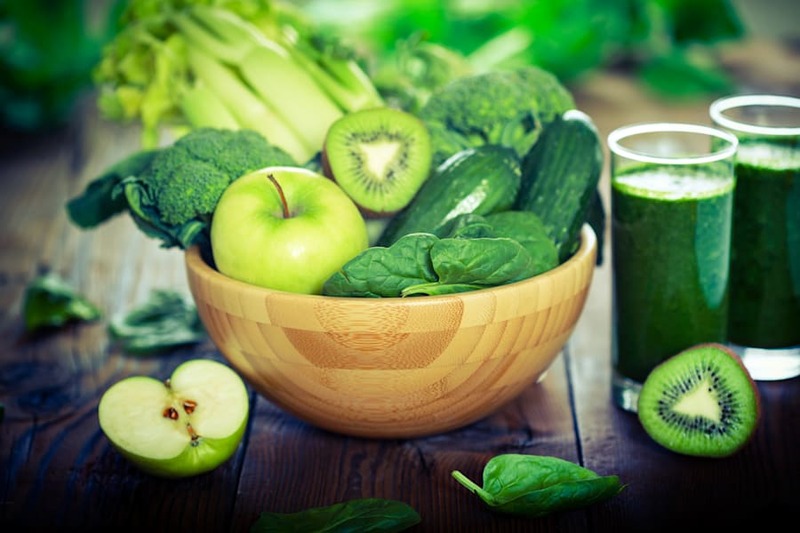 "Plant-based foods are, in general, far less inflammation provoking. They're anti-inflammatory," Rolls said. "As an athlete, you're always trying to improve and enhance your recovery. You get stronger and faster and more powerful in the time in between workouts, when your body is trying to repair the tissue damage from exercise-induced stress. 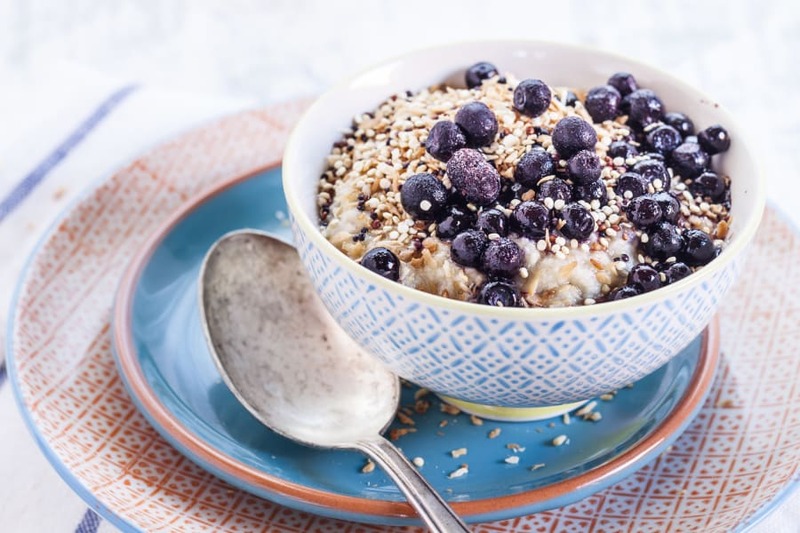 "Eating plant-based reduces inflammatory responses which allows the body to rehabilitate itself more quickly, meaning you can bounce back more quickly, which in terms means you can train harder and you're less likely to get overtired, over-train or injured. "When you protract that over the course of a season or a year, you're going to see tremendous performance gains. I think eating plant-based is optimal for athletes." And what about protein? Aren't vegans protein deficient? "All I can say is I've been doing this for 10 years and I haven't had a problem building lean muscle mass." "There's vegan athletes competing at the highest level across all different disciplines -- in football, in basketball, MMA, hockey and soccer," Roll said. "There's plenty of triathletes, runners and ultra runners. Scott Jurek, perhaps the most celebrated and decorated ultra runner of all time, is a long-time vegan." 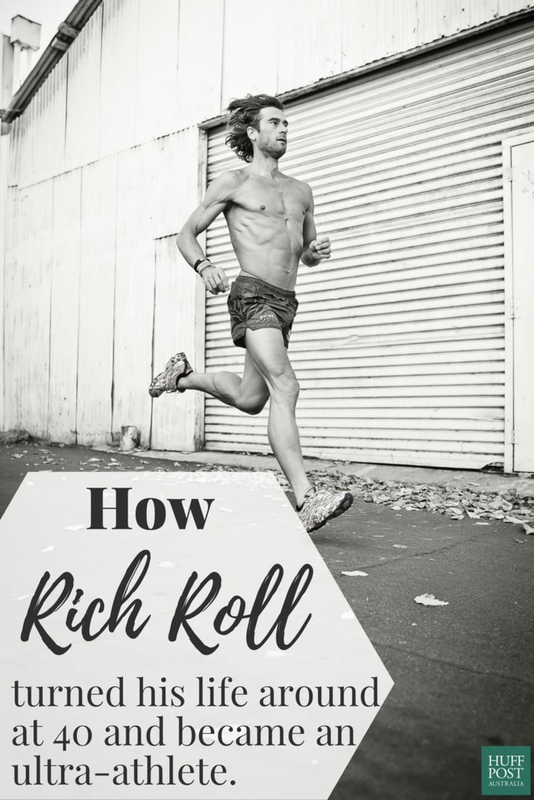 Wondering what Rich Roll eats in a day? Us, too. "In general, I get up anywhere between 5 and 6am. I usually do my training in the morning," Roll told HuffPost Australia. "Sometimes I wake up, drink a bunch of water, maybe have a small cup of coffee, and I'm out the door to train. I won't eat anything." If Roll plans to train super hard or is facing a very long training session, he'll have a large smoothie. "Breakfast for me is usually a smoothie in the Vitaminx comprised of dark leafy greens (like kale, chard and spinach), beets and beet greens, berries, pineapples, superfoods (spirulina, chia seeds, hemp seeds, ground flax seeds), coconut water, citrus, banana -- I have four kids so often it's just whatever we happen to have in the fridge. "If I'm super hungry, I'll have almond butter on gluten-free toast, or cold quinoa with berries and coconut milk." "During the workout, if it's a long bike ride, my go-to fuelling sources are bananas, sweet potatoes and dates. For running, almond butter or coconut water, but usually I don't bring anything." "Post-workout is usually another smoothie. It's similar to the one I mentioned with the exception of a scoop of protein powder, sometimes. But I don't always do that -- maybe once or twice a week." "Lunch is usually a big salad. I try to keep things light. Eating fruit, nuts and salad throughout the day is my typical thing," Roll said. "I don't sit down for a big lunch meal. I graze lightly throughout the day." "My big meal is dinner. My wife is an amazing cook. We have anything from vegan enchiladas and burritos to burgers. We do eat a lot of Mexican food." "Protein powder or supplements are not a big part of my routine. I'm not worried about not meeting my nutritional needs," Roll said. "I take a B12 supplement, which is the only supplement I take."